As the students work on their projects for 20 Time, my 20 Time project is the 20 Time project if that makes sense. When I look at this year, I feel like I have not done a very good job. I honestly feel like a terrible teacher. I have to go into more detail, but that is just what I feel as I sit here at the computer. Last year was an amazing year for 20 Time. I felt like I had the perfect collection of students and the enthusiasm of trying something new in the school. Kids were excited and things ended with a TEDx event. At the end of the year, I was burned out and was not sure if I could do 20 Time again because of how much it took out of me. I convinced myself that the next year will be easier because I know how to do everything and I can make adjustments based on the first year experiences. I think that was my first mistake. My body was trying to tell me something about the amount of work that a project like this takes. For me especially, I give my all to my students. Some do not see it, but I take it to heart when a student is not happy in class or life in general. I carry the weight of their problems around when I know times are tough. I lose sleep because I worry about all of the things they worry about and I want to create the best possible learning environment for all of my students. When I find out that something I said or did has bothered or hurt a student, it sticks with me for weeks. I wear my heart on my sleeve and it is painful at times, but I feel it makes me who I am. Despite the toll 20 Time took on my, I jumped in for this year thinking I could make it better. I did not. For this year, I was much more hands off. I wanted to give students more freedom in their projects and really see where they go. I see now that this was a big mistake and I feel I have failed my students in a way I can never make up. My job is to guide them and I feel I did not guide them nearly as much as I should have. Supporting students in work is such a fine line. I do not want to be too involved and I do not want to be absent. I thought last year I was too involved and now I realized I might have been involved just the right amount and that is why everything went as well as it did. This realization does not fill the whole in my gut though. Failing because you are trying something new is one thing. Failing after doing something that went well feels much different. Was I selfish in backing away this year so I would not be so spent at the end of the year? Was I too loose with everything this year because I was confident in how it went last year? Is my ultimate sin Hubris? If it is, I'm so embarrassed. My school went to the Henry Ford museum for a PD day. One of thing my principle said about Ford was that he was the leader, but he became complacent and others caught up and surpassed. As a school we cannot become complacent with what works. Instituting 20 Time in the first place was a way I tried not to be complacent. However, since it went so well, I think I became complacent and that has lead me here. People have told me that trying something new and it not working out does not make me a bad teacher. My principal has told me this is an opportunity for growth. I am a believer in the Growth Mindset, but when something blows up in your face, those are just words when you are hurting. I titled the post "I've Failed and It's Not OK" because I feel the failure was foreseeable and that is why it is not ok. I'm afraid that this failure will keep me from trying new and different things. It really has me questioning my approach all together. I think only time can help me figure this out. As I close this post, I know it is important to think about the future. What do I do to move forward? Do I bring 20 Time back? Do I change everything? Is this a failure I can come back from? Reflections pieces do not have to have answers. Sometimes asking the right questions can lead to the right answers later on. I just hope I'm asking the right ones. The North Carolina Virtual Public School (NCVPS) Peer Tutoring Center (PTC) is a student run organization providing peer tutoring and other virtual support services to students across North Carolina. The 60+ student volunteers staffing the PTC use collaborative tools such as Blackboard Instant Messenger, Blackboard Collaborate, Blogspot, email and texting, to connect and engage students with their academic learning. The PTC benefits students by providing content specific support in the form of peer tutoring, but our services go beyond tutoring. We also provide Virtual Buddies as a support system for unmotivated students or those who are unprepared for online learning. Through the use of encouragement, gentle reminders, and assistance with time management and acquisition of study skills, our Virtual Buddies help students overcome obstacles preventing the student from engaging with their course content. The PTC also publishes a blog, TutorTalk, which focuses on how to be a successful, well rounded student. The PTC volunteers are actively engaged in all aspects of the organization's operations. By allowing our student volunteers opportunities for leadership and real world experience in teaching, blogging and marketing, the PTC takes its volunteers well beyond the classroom. Crystal is a long time virtual educator with 14 years experience teaching Career Technical Education. She began working with NCVPS as an instructor in 2007 and as a Research Development Innovation Specialist in 2008. In 2009, she collaborated on the creation of the North Carolina Virtual Public School's Peer Tutoring Center. In this episode, William Chamberlain (@WmChamberlain) talk about Blogging and giving students a voice outside of the classroom. If you have been interested in connecting your students with others teachers and students, this is the podcast for you. Check out #Comments4Kids for more info on making these great connections. You can download this episode and previous episodes on iTunes or you can find them on my podcasting channel. If you liked what you heard, help a nerd out and leave a rating or a comment. I always love feedback. I've had a student who has not been feeling well. Students asked if we could make a video to cheer her up. I asked the Internet for help and the world responded. Here is a video that a student put together during her Spring Break. If you have a moment, leave a comment to remind Emma how awesome she is. The Maker's Lounge has been my project this year and I'm really excited about the possibilities for our students. While some may see the space as an exclusive spot for STEM and STEAM projects, that is not the case. We really want students to claim the space and tell us what they want to use it for. I thought a simple way to do that would be to ask them. Post-it® Notes are synonymous with ideas. I've used them for as long as I can remember as a student and they fill my desk with reminders and random lesson thoughts. Students still use Post-it® Notes to aid in studying. Placing them out for students to use was a simple step in getting students to share their ideas. I used our MarkItUp Table (It converts from a table to a standing board) to leave students a note. I simply asked them to use the Post-it® Notes provided to leave their ideas on how they might use the space. 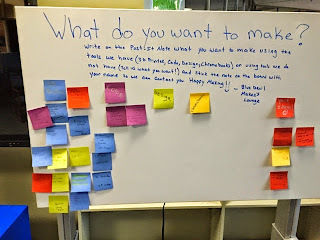 I was not remotely surprised to check back the next day to see the space on the board start to fill up with great ideas. Students want to try their hand at 3D Printing and so many other ideas. One student wants to create a program that can simulate rowing to help the Crew team at our school. He wants to look at coding and see what is possible. I have other students that want to explore robotics and how coding fits in that area of science. There are so many more ideas and it was nice to see students use the Post-it® Notes and place them around the board to match other ideas. Not everything has to be a high tech gadget to solve everyday problems. Post-it® Notes will continue to be a vital part of my planning and idea process as a teacher and it is nice to see that it is an active part of the student's process as well. We want to give students as many opportunities as possible to create/make. That is what this space is all about. Post-it® Notes are perfect for letting anyone get the ideas out of their head and on paper. 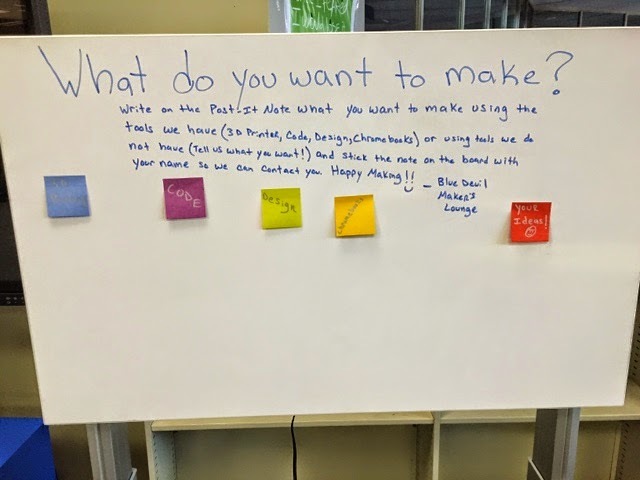 The Post-it® Super Sticky Notes are awesome because they will allow students to move their ideas around on this board and another board we are working on in the space. In a couple of weeks, I will share another way that we are using Post-it® Notes in our Maker's Lounge that allow students to connect, collaborate, and create. I'm so glad I was able to have +Sherry Gick on the +NerdyCast this week to talk about libraries and learning spaces. She brings tons of great insight into what it takes to create an environment for all learners to feel welcome and comfortable to explore the things they are most passionate it about. It is a fun conversation that does not only apply to libraries. Any educator that is in charge of space should take a moment hear the great ideas Sherry offers to create a more positive space for students and for teachers. Also, if you are a Doctor Who fan, listen to us fanboy/fangirl over our favorite episodes. This presentation will explore how the affordances made available by learning management systems (LMSs) can help meet the needs of all students by individualizing learning. Individualization refers to instruction that is paced and adjusted to the learning needs of different learners. A teacher who individualizes instruction selects technology and responses to support the learning needs of the individual learner and monitors learning to decide next steps and integrates an assessment of learning. Yet, most LMSs are not utilized to their fullest potential and participants in this session will learn about how instruction can be individualized through adaptive and conditional release. Matthew J. Kruger-Ross is the STEM Professional Learning Coordinator for North Carolina Virtual Public School. He is also a doctoral candidate in Philosophy and Education at Simon Fraser University in Burnaby, British Columbia, Canada. After completing his BS in Middle Grades Education from NC State University in May 2005 Matthew stepped into the classroom at Carolina Friends School, an independent Quaker school in Durham, North Carolina, where he taught math, music, and technology in the middle school. After four wonderful years, he chose to leave CFS and pursue advanced degrees in educational technology, philosophy and critical studies. In May 2012, Matthew completed his Masters of Science in Instructional Technology at NC State University in Raleigh, North Carolina. Matthew’s research interests include philosophy of education, philosophy of technology, transformative learning and critical studies. I've never really thought about the value of a Teacher Librarian in my early years of teaching. They were the person in the library that got books for kids and made sure the computer lab schedule was maintained. To be honest, I didn't really have any idea what they did. Thanks to Twitter, that viewpoint has evolved tremendously. I've always been close with the TL in my school, but it was far more social than work related. This year, that has all changed. 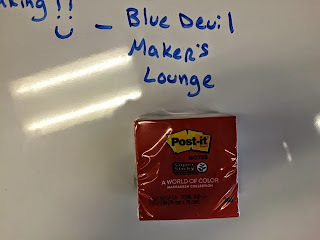 We have worked side by side to bring a Makerspace (Blue Devil Maker's Lounge) to our school. We have collaborated to create a space that we hope will encourage students and teachers to explore new skills and create amazing things. She has been a strong advocate for technology in the classroom and understands the type of support students and teachers need to be successful. She is a hardworking and awesome person and I wish I would have used her as a resource earlier in my career. +Courtney McGuire (@CourtneyLibrary) is where you can find her on the interwebs. This project has really been a wonderful partnership and we both have the same passion for helping students learn and supporting their different interests. Besides being a shout out to my partner in crime, I want to encourage all of your to reach out to your TL and see what types of projects you can create together. The library is not an outdated place filled with books. It can be much much more if teachers and TLs work together to support students and staff. TLs have access to so many great resources that they can add to almost any lesson you are crafting. 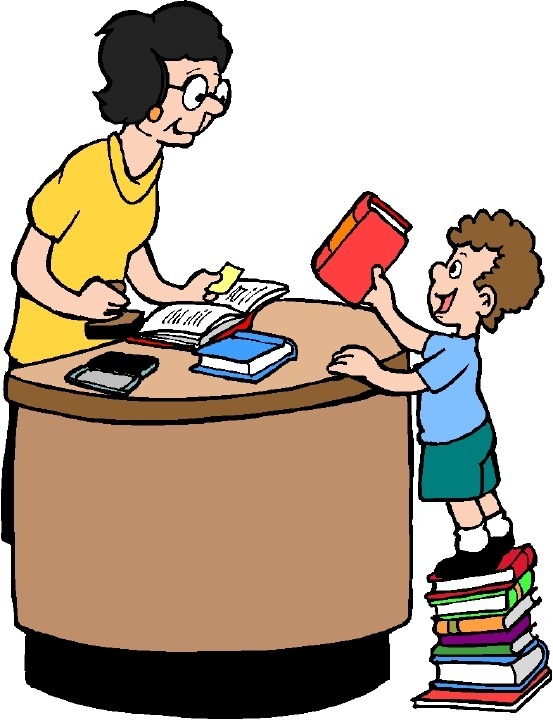 I read somewhere that Teacher Librarians were Google before Google. They can help you with anything and it is worth it to reach out and connect. I have gained so much respect for the TLs the past few years and I really hope more teachers reach out and collaborate with their Teacher Librarian. I can't wait to see what we can come up with next.